As an accountant, I regularly receive calls from software companies, inviting me to trial their product. So when I was first approached by Xero I have to admit that my initial reaction to the “salesy“ (although admittedly slick) marketing pitch was to run a mile. But actually, Xero proved to be anything but an unwanted distraction. I’d been a big fan of online cloud accounting software for a while but after years of recommending various options to clients, the software that was consistently coming up trumps was Xero. Roll on several years and I’m now working exclusively with Xero. I’ve witnessed first hand how Xero can make a real difference to the way small business owners cope with the demands of bookkeeping and how they’re happier and feel more empowered when they can see a real-time picture of how their businesses are performing. In my day to day conversations with small business owners, it’s increasingly apparent that most have heard about Xero through a friend or family member but perhaps aren’t sure about what Xero actually does and how it can help them in their own business. 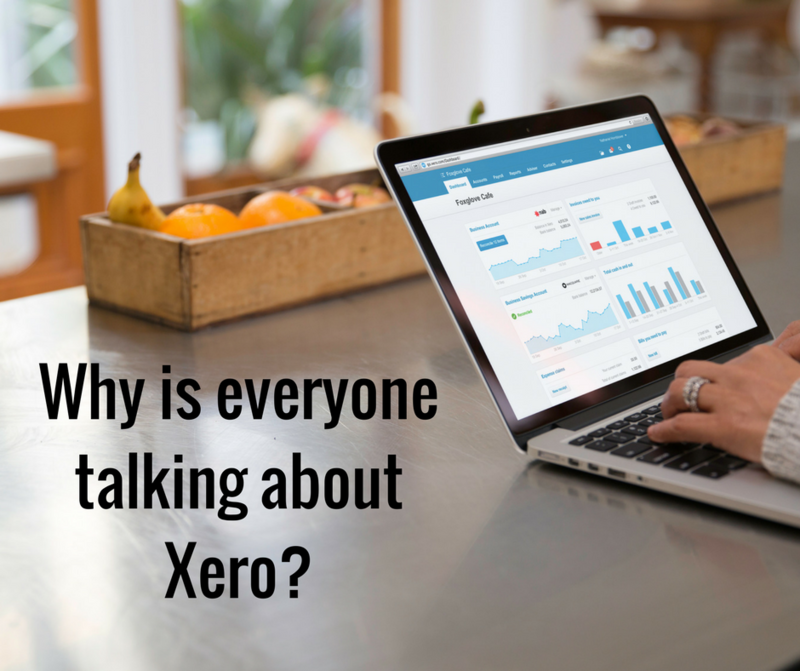 So what is Xero all about and why is it so popular with small business owners? Xero is a cloud based accounting software package. The “cloud” is a platform to make data and software accessible online anytime, anywhere and from any device (such as your phone, laptop or ipad) providing you have internet access. Think of internet banking and you’ll grasp the concept. If you’re used to tedious upgrades and regular back-ups using desktop software, operating in the “cloud” means that your data is backed up automatically and upgrades happen without you even knowing about them. Will Xero suit my business? Xero was desgined for small business owners. Whether you’re a restaurant owner, photographer, alternative therapist, author, contractor, singing teacher, retail outlet, building company, interior designer or marketing consultant, Xero will work for all business types. So why is Xero so popular with small business owners? One of the comments I frequently hear from clients and particularly those who have worked or trialled other software packages, is how easy it is to use and how simple to navigate. Complicated accountancy jargon is replaced with easy-to-understand terms such as “spend money” and “receive money”. Too many businesses particularly those who record their business transactions on Excel are running blind and don’t really have a grip on answers to the key questions that could be driving their businesses forward. How your business has performed this month, this year? How much have you spent on purchasing materials to make a product or advertising? How much money do you owe HMRC for VAT? Which customers owes you money and how much? Who do you need to pay and when? With one or two clicks on Xero, this information is readily available to help you make important decisions for the financial benefit of your company. The heart of any small business revolves around money coming in and money going out but to ensure the accounting records are both accurate and complete, you need to check each transaction (a money in or money out item) to the bank statement. The term used by accountants for this checking process is Bank Reconciliation. With Xero, you can set up an automatic feed of all your bank transactions to come into Xero each day. From then on, Xero works it’s magic by automatically matching up items from the bank to invoices held in Xero. For transactions with no invoice such as direct debits, “bank rules” can be set up on Xero to automate the matching process. The automation of this previously manual procedure saves an enormous amount of time as well as providing you with a real-time view of your cash position. Digital copies of contracts, invoices and receipts can be sent directly into Xero and attached to transactions. Not only can you store all your paperwork online but this will save hours of trawling through boxes, files, folders and emails to find that one all important invoice or document you’ve misplaced. There are some great add-on applications which make this process even faster. Take a look at Receipts Bank or Datamaolino. If you’re out and about, you can use the Xero Touch app which allows you to scan your invoice/receipt and with a few clicks, you can update your online accounting records. Sending an invoice to your customer on Xero won’t take more than a few minutes and even less time if you want to send recurring invoices. If you are quoting for your services or make up of a product, accepted quotes can easily be converted to invoices. This saves a lot of time if you’ve been used to a dual process of issuing a quote followed by an invoice on Word or Excel. Invoices once sent to customers are logged onto the system and any cash coming in is allocated automatically to the invoice (when paid in full). You can check whether invoices have been viewed by the customer and can chase any outstanding amounts with automatic invoice reminders and/or statements. Faster cash collection means better cash-flow for your business. If you want to stop your subscription at any time, you can do so. For more information on pricing plans click here. It’s also worth checking for any special offers. If you want to test trial Xero for FREE before making any commitment, you can do a 30 day Trial. As intuitive as Xero is, no two businesses are the same and I would always recommend that you receive some expert help in setting up your accounts on Xero. I offer set up and training tailored to each business I work with. If you would like a free one to one consultation, please drop me a line here. You may be keen to move from a different software package or perhaps you’re already set up on Xero but need some ongoing support with your bookkeeping. Either way, I can help. The very best time to move to accounting software is at your accounting year end. So, for all those with a March year end, now is the time to start planning ahead. Under HMRC’s proposed Making Tax Digital plans that could come into force from April 2018, all small businesses may be asked to submit accounting information to HMRC four times a year. This could be via a free app that HMRC is developing. If you are already operating your accounting on software by 2018, you will be well placed to satisfy HMRC demands. Enjoyed this post? Found it helpful? I’d be delighted if you felt able to share with other small business owners using the icons below. And don’t forget to join my mailing list to be the first to receive more tips just like this. I hope you won’t want to but it’s really very easy to unsubscribe at any point.